Adding fresh Driscoll’s berries adds a tart, sweet freshness to complement the richness. This is the perfect Cheesecake Bars Recipe! Creamy luscious cheesecake bars with a buttery graham cracker crust and topped with fresh berries is a crowd-pleasing popular dessert! There’s an art to making a rich, creamy cheesecake. It needs to have a silky smooth filling with a buttery sweet graham cracker crust. 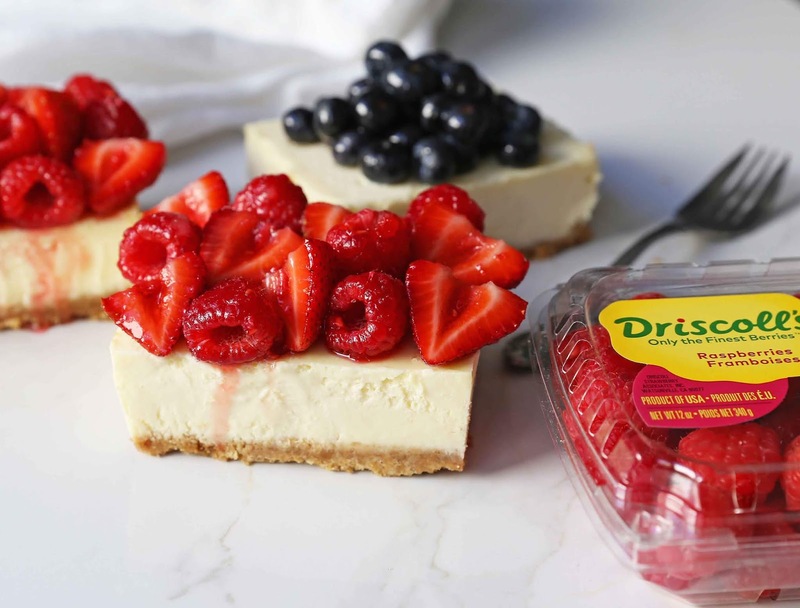 Adding fresh Driscoll’s berries adds a tart, sweet freshness to complement the richness. This is the perfect Cheesecake Bars Recipe! How to make perfect berry cheesecake squares? It is all about the simple quality ingredients and special techniques to set it apart. To make the perfect cheesecake filling, it starts with the star ingredient, cream cheese. Next, you add sugar, eggs, egg yolk, sour cream, a touch of flour, and vanilla. It is the best creamy cheesecake filling! Why is it important to bring the cheesecake ingredients to room temperature? It is important to bring the cream cheese to room temperature before mixing in order for it to incorporate and aerate. In order for it to become light, fluffy, and airy, it needs to be at room temperature. 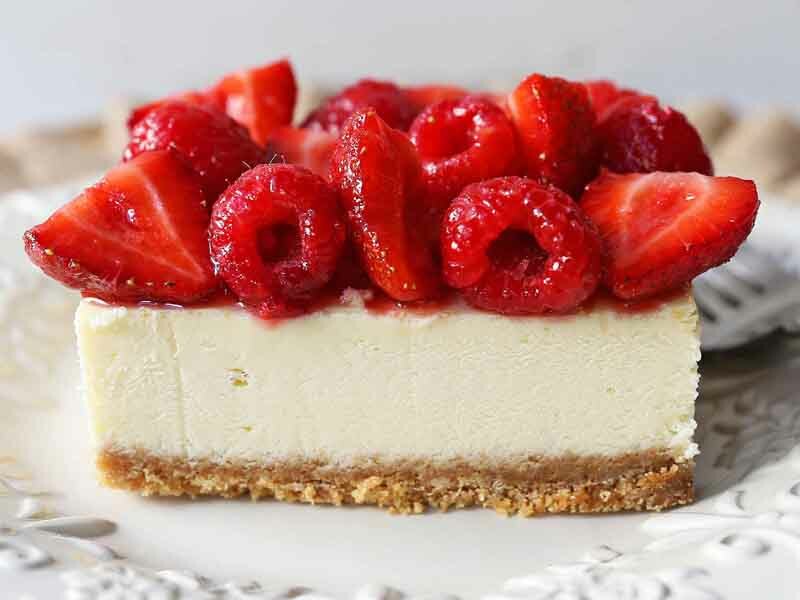 The cheesecake is beaten for several minutes to create air which helps create a tender texture. Why is sour cream added to cheesecake? Sour cream will lighten the density of the cheesecake batter. Since there is so much cream cheese in cheesecake, sour cream adds more fat but lightens the batter. Always use full-fat sour cream in cheesecake. Why are eggs important in cheesecake? Eggs are the important structural element of the cheesecake as they act as the binder to bring the ingredients together when baked. Eggs act as a stabilizer for the cheesecake. The extra egg yolk adds richness to the batter. Vanilla extract is added to invoke a warmth to the creamy cheesecake. Use a high-quality, pure vanilla extract to allow the vanilla flavor to come through. I am sharing tips and tricks for making perfect cheesecake bars. These are so beautiful to serve at parties or events since you can make them bite-sized. 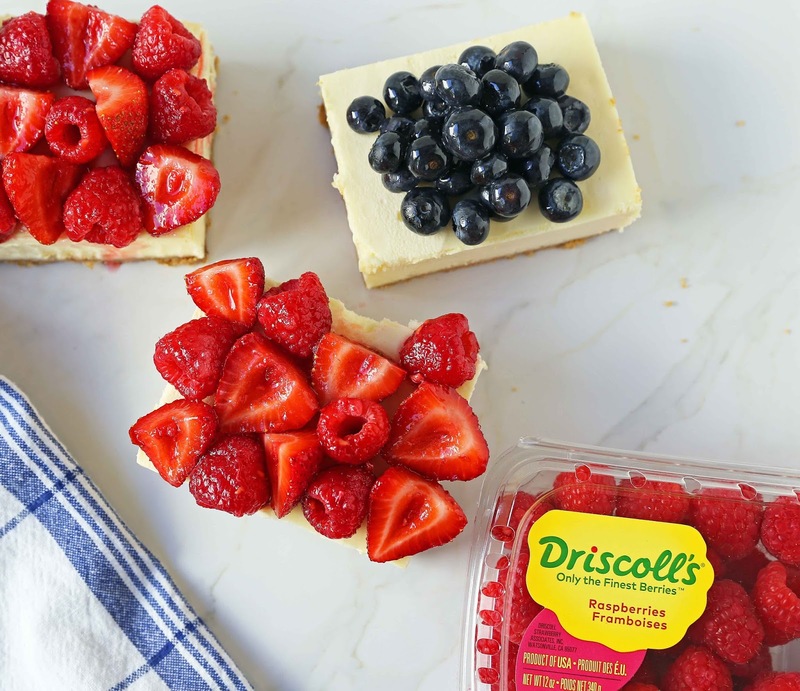 I love to top these berry cheesecake bars with vibrant Driscoll’s berries because they add a sweet fresh flavor to the cheesecake. I always have Driscoll’s berries in my refrigerator! It is no wonder why they are the best. When determining where to grow, Driscoll’s follows the sun in order to provide great tasting raspberries year round. The secret to how Driscoll’s berries are always so flavorful? Driscoll’s Research and Development team starts with thousands of berry varieties and choose the top 1% to sell under the Driscoll’s name. Start with high-quality cream cheese. Make sure it is a room temperature to allow it to become light and fluffy when mixing. Cream for 3-4 minutes, scraping the bowl often to allow the mixture to aerate. Add sugar, a touch of cake flour, and salt and cream for 2 minutes longer. This allows the cream cheese and sugar to come together and create a silky smooth texture. Add the eggs, egg yolk, sour cream, and vanilla and continue to beat until mixture is fully incorporated. Make the crust by pulsing graham cracker crumbs, butter, brown sugar, and an egg white to help bind it together. Pour into a 9 x 13 pan (preferably aspringform 9 x 13 pan like this one to make it easy to cut). You can also use a traditional 9 x 13 baking pan. Bake until firm to touch in the center. Let cool for at least one hour. After it is cooled, refrigerate for at least 8 hours or overnight. It helps to freeze the cheesecake ahead of time to make it easier to cut. Tip: dip a sharp knife in hot water to cut cleanly in squares. Top with fresh Driscoll’s raspberries, strawberries, blueberries, and blackberries. In a medium bowl, combine the graham cracker crumbs and brown sugar. Add the melted butter and stir well with a fork. Add egg white and mix well. *This can also be done in a food processor. Prepare a 9 x 13 pan. Press graham cracker crust mixture into bottom of the pan. Bake for 7-8 minutes. Set aside to cool. REDUCE heat to 275 degrees. In a large mixing bowl, beat the cream cheese for 3 minutes, until light and fluffy. Scrape down the sides of the bowl. Add sugar, cake flour, and salt. Beat for 2 minutes or until mixture is creamy. Add eggs and egg yolks and beat for 2 minutes. Stir in sour cream and vanilla and beat for 1 minute. Spread the cheesecake batter on top of the slightly cooled graham cracker crust. Bake at 275 degrees for 30-35 minutes, until firm to the touch in the center. Remove from oven and set aside to cool for 1 hour. Using a spatula or sharp knife, run along the sides of the pan to loosen the cheesecake from the sides. Refrigerate for at least 8 hours or overnight. Before cutting, place in freezer to make it easy to cut into squares. Cover and freeze for 1-2 hours. Slice the cheesecake into 2-inch squares. Tip: keep a glass full of hot water handy to dip the knife in to slice evenly. Top with fresh Driscoll's berries -- strawberries, raspberries, blueberries.